REDDING, Calif. - The Simpson University men’s basketball team hosted the National Christian College Athletic Association (NCCAA) Division I West Regional championship game against the Bethesda University of Anaheim Flames on March 10. 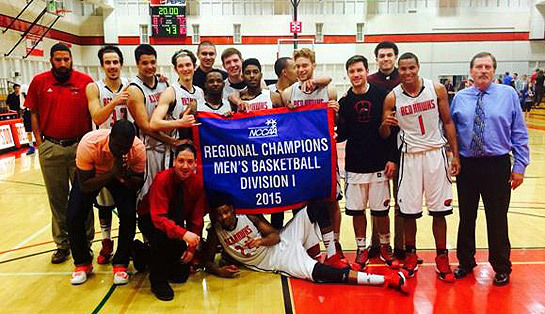 The Red Hawks were able to pull off the 81-72 victory and earned a bid to the NCCAA championship tournament. The Red Hawks came out strong, with the first points of a game being a three from Jonnie Washburn. The first half was fast-paced and at times rushed. Simpson had 11 turnovers and trailed by only three at halftime after a buzzer beater from Sam Siler. To keep the season alive, the Red Hawks had to come out and take control of the game in the second half. With a new line up to start the second half, the Red Hawks were able to battle their way back. Anthony Williams hit a jumper with 17 minutes left to play in the game, and Simpson was able to hold the lead. Bethesda was called with two technical fouls in the second half, and Marc Kirkland shot both pairs to add four to his total points on the night. The Red Hawks took the lead and never looked back, beating Bethesda with a final score of 81-72 and earning the title of 2014-2015 NCCAA West Regional champions. Sixth man, Marc Kirkland, was the Red Hawks leading scorer on the night with 19 points. Shaquille Jones shot 74 percent from the three-point line, ending the night with 18 points. Simpson will head to Indiana next week to compete in the NCCAA national tournament. Story by Hannah Saylor. Photos by Katie Lenik. Photo top: The Simpson University men’s basketball team holds up the NCCAA DI West Regional championship banner. 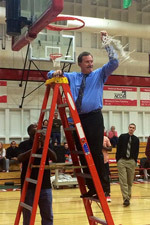 Photo bottom: Head men’s basketball coach, Jim Holcomb, cuts down the net after the Red Hawks’ victory.